The lovely Margaret River, which serves as the name of a town, river and region that surrounds it, is something of a hidden gem on Australia’s west coast. Located just over 3 hours’ drive to the south of Perth, the region makes for a great getaway destination that is an impressive showcase of all things natural – its scenery varies from the impressive rugged coastline to awe-inspiring limestone cave networks, and further on to rolling green vineyards and wineries that stretch as far as the eye can see. The area is also renowned for its culinary delights, with those aforementioned wineries making for much more than just a pretty sight – they’re responsible for some of Australia’s best up and coming wines, and when combined with the array of fresh produce grown in the region can combine for some truly outstanding eating and drinking for locals and visitors alike. Couple all of these with great surfing, plenty of wildlife, and a charming local shopping scene, and there’s a reason why Margaret River and its surroundings are quickly becoming considered one of Australia’s true destinations on the rise. 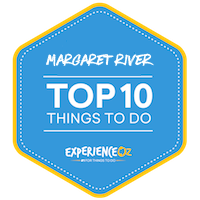 If you’re planning to visit Margaret River and not sure how best to spend your time there, here we break down the Top 10 Things to do in Margaret River and surrounds in detail. There’s no getting away from it: wine is one of Margaret River’s most famous calling cards, and its presence and consumption permeate almost every other part of experiencing the region in some form. A huge drawcard for many choosing the destination as their travel spot, the area is home to over 150 individual wine producers ranging from tiny boutiques to major labels that continue to grow in national and international renown every year. From Chardonnay to Sauvignon, the region boasts a wide portfolio of quality mainstream wines, as well as more unconventional niche, produce that is sure to delight the connoisseur. Margaret River’s maritime climate plays a large role in its striking suitability to grape-growing conditions, with both temperature and rainfall ranges falling among the ideal. As a result, those with a taste for a drop of the good stuff will be in heaven here, as the opportunities for getting out and sampling a glass or several are present both in and around the town. Names such as Brookwood Estate, Cape Naturaliste Vineyard, Stella Bella Wines, Cape Mentelle and Woody Nook among others all rate highly, however planning out an itinerary and choosing from the vast array by yourself can prove a challenging task. Winery tours are thus an incredibly popular pastime, allowing visitors to enjoy the “fruits” of the region without having to concern themselves with the responsibility of driving, and it’s in this regard that local operator Margaret River Discovery Co. shines. Offering itineraries that aim to cover the best wines of the region in a single, comprehensive package, their tours provide guests with a behind-the-scenes wine experience that covers sightseeing, tasting, history and off-road adventures all in one. Specially chosen wines that augment a delicious degustation menu are what the Margaret River culinary experience is all about, and these tours deliver in full while also providing a whats-what of local regional highlights along the way. There’s even a canoeing portion that gives a look at the area from an entirely different angle! Margaret River Discovery Co. are renowned for treating their guests as friends rather than mere customers, and it’s the combination of this attitude, local insider knowledge, and going the extra mile to expand the standard winery tour experience that make heading out on a tour with them our consensus pick for the best way to enjoy Margaret River’s delights. Margaret River isn’t all water, wildlife and wine; it’s also home to one of the most spectacular natural attractions in Western Australia the likes of which is only really matched by a similar offering in New South Wales. We’re of course referring to the region’s amazing limestone cave networks, the visual pinnacle of which is the stunning Lake Cave located amongst a pristine nature reserve around 20 minutes’ drive to the south of Margaret River town on the aptly-named Caves Road. While it’s far from the largest cave in the region, it’s arguably the most beautiful. Entry to the cave is gained via a relatively long descent down a flight of 350 stairs leading into the heart of the massive doline, which is a sight into and of itself. While it’s a somewhat intimidating initial approach to the attraction, the reward after making the trip down is well worth the effort. What is found within after entering the cave is simply an example of nature at its most pure, beautiful self – a massive number of stalagmites and stalactites formed over thousands of years from dripping, mineral-rich water. Man-made lighting is used to full effect here, with both neutral tones and other vivid colours illuminating the cave walls to give it a surreal touch. Lake Cave derives its name from its constant body of water which provides a mirror-like surface for the lighting to reflect off, amplified by its one true gem, its floating suspended table formation, which is one of only two of its kind in the world. Throughout your exploration of the cave, your guide will provide an enlightening and entertaining narrative on how this and other similar caves came to be, with history on Lake Cave itself as well as the technical formation of the rock formations outlined in detail. Guides accompany visitors for safety reasons as much as to provide information, as it’s a fairly strenuous trip and the presence of water can make incidents and rare but possible factor; however their degree of experience and friendly, reassuring nature is more than enough to allay any fears one may have. While it’s only a single room rather than a massive, winding network, the guides are experts at making the whole tour interesting. t’s a peaceful and somewhat alien landscape that’s best visited outside of the school holidays if possible, as the noise from rowdy children can shatter the mood somewhat. There’s also a decent amount of quality facilities set up around the cave such as toilets and a cafe that makes extending the experience and relaxing amongst the lovely surrounds a possibility, too. If you’re prepared to put in the effort and push past plenty of stairs, you’ll come away with an experience of one of Australia’s most spectacular show caves – and given the rarity of such a perfect natural formation, if you’ve made the trip to Margaret River then Lake Cave should be near the top of any travel itinerary. Just think of the required investment of exercise as a healthy bonus! One of the key highlights of the annual sightseeing calendar, the greater Margaret River region is home to some of the best whale watching in Australia, boasting both high whale numbers and one of the longest-running whale watching seasons in the world. Typically running from May all the way through to early December, the length of the season provides numerous chances for visitors to the region to take part in what is widely acclaimed as one of nature’s most impressive wildlife spectacles. While the abundance of whales to be found in this part of the west coast during peak whale season means that even on-shore viewing is a possibility (Dunsborough’s Lighthouse on its rocky outcropping being a favourite vantage point for many), if you’re looking to get the most out of your experience you’ll want to book a tour and get out on the water to see these gentle ocean giants up close. As a result, there are several whale watching tour operators that run in the region, with popular departure points including Augusta in the south, along with Busselton and Dunsborough further north, all serving as valid spots to commence your sightseeing journey. Whales aren’t the only wildlife stars of the proceedings either; the waters off the coast of the greater Margaret River area are also home to Bottlenose Dolphins, numerous kinds of seabirds, and even New Zealand Fur Seals, adding a diversity that few other Aussie whale destinations can match. Travelling from north to south (and vice versa), the whales make their way directly past each of these towns from cape to cape, pausing to take a breather in the sheltered waters of both Geographe and Flinders Bays, giving their calves time to recuperate as well as providing some well-deserved playtime for the animals during their epic annual migration. During the journey you can expect to see plenty of both Humpback and Southern Right Whales – a rare combination in Australia – and, if you’re lucky, you may even catch a glimpse of Minke Whales and the world’s largest living creature, the Blue Whale. Augusta, in particular, deserves a special mention as a whale watching locale as it’s one of the points at which the whales come closest to the actual shoreline, so if you’re looking to stay on dry land and catch some snapshots, it makes for a solid choice of spots. Local whale watching operator Naturaliste Charters, who operate out of both Augusta (30 minutes to the south of Margaret River town) and Dunsborough (45 minutes to the north) is our pick of choice here, due to a combination of both their experience, knowledge, and viewing possibilities their vessel provides, so if you’re wanting to ensure you’re going to get a reliable and informative whale experience in the region, they’re one of your best bets. There’s a reason this part of Australia has both been given the nickname the “Humpback Highway” and has won previous awards as the premier whale watching destination in the country – and with such a wide date range for visitors to choose from, it’s also one of the most accessible and thus one of the Margaret River region’s essential must-do’s. Culinary culture plays a key part in what makes Margaret River tick, and this is more than adequately reflected in the array of great restaurants that call the region home. The mild weather and large amount of sunshine are conducive to producing all manner of great fresh produce, and this is put to good use by many of the award-winning chefs who ply their trade in the area. Dining options on offer in Margaret River are many and varied, and although they range the full spectrum from simple burger joints to multi-course degustation menus, the overall quality is almost universally high, reflective of the pride the locals take in their food and dining experiences. It’s all of these factors combined that help contributes to Margaret River’s status as perhaps Australia’s best regional gourmet location. While your choice of place to wine and dine will likely be largely dependent on your budget, there are enough options within the town and its surrounding areas to cover most any price constraints you may have, and at the majority of dining on offer provides that good old-fashioned country hospitality that one simply doesn’t often get when dining out in larger cities. The dining scene incorporates the best in worldwide, modern food trends while still retaining typical, proven flavours and ingredients. The majority of Margaret River’s restaurants are grouped together along the main artery of the town, the Bussell Highway, which runs from north to south and makes doing the strip of essential local dining a fairly easy prospect, while those looking for the more gourmet-focused winery style lunch experiences will have to head a short way out of town. Unsurprisingly given the region’s strong wine-producing culture, many of the higher-end fares on offer are based around providing courses that complement wine choice accordingly, and knowledgeable waitstaff are always on hand to provide recommendations as to whether a Sav Blanc or Pinot Noir is likely to add the finishing touch to your meal. A living testament to what a large role culinary culture plays in the Margaret River region is its Gourmet Escape – a four-day festival that is a packed celebration of all-things-dining that attracts some of the most famous figures from the chef scene as well as thousands of eager visitors keen to take part in the discussion, preparation and consumption of food. Divided up into various subsections, the event’s Gourmet Village serves as the core focus and is filled to the brim with live food demonstrations and Q&A sessions, cooking classes, and, of course, wine tastings. The event takes place in November, so if you’re planning to visit Margaret River during this time you’d be nuts not to pay it a visit. In short, if food is any kind of priority when you consider the choice of a holiday region, then Margaret River is almost certain to deliver the kind of taste sensations that will have as much of an impact on your memories as its sightseeing and attractions. While Eagles Heritage Wildlife Centre mentioned above specialises in all-things-avian, this charming animal attraction takes the wildlife experience one step further by offering a large array of creatures from all over the animal kingdom. The facility scores major bonus points for being particularly hands-on, with a high level of emphasis on interactivity with the creatures of all kinds that both kids and wildlife lovers alike will no doubt appreciate. Sunflowers Animal Farm offers a slice of authentic Aussie farm life with a dash of additional, more unconventional animals mixed in, you can expect to be able to interact with the likes of pigs, rabbits, lambs, kangaroos, alpacas and much more, many of which are young which adds an extra touch of cuteness to the proceedings. If you’ve got children, they’ll be in their element here as they’ll be able to pet, feed and play with the majority of the animals which are all situated at various points amongst the layout of the huge farm. Buckets of food are available for purchase while washing facilities are also on hand for after you’re done – prepare to get a least a little animal saliva on your hands! Other traditionally fun farm activities are also on offer at Sunflowers Animal Farm include pony rides (a favourite amongst little girls in particular! ), gathering eggs, tractor rides and plenty of other things to keep the younger ones occupied for hours. There’s even a playground for them to burn off their energy while you take a breather, which is a nice touch. Sunflowers Animal Farm also doubles as a rustic farm stay accommodation facility for those looking to spend a night or three, and it’s a truly intimate experience that makes for a refreshing change from the typical cardboard-cutout hotel experience. Other traditionally fun farm activities are also on offer at Sunflowers Animal Farm include pony rides (a favourite amongst little girls in particular! ), gathering eggs, tractor rides and plenty of other things to keep the younger ones occupied for hours. While there are no stores or cafes on hand which sell (human) food, guests are welcome to bring their own supplies – and with barbecue facilities on hand, the farm makes for a pleasant location to enjoy cooking up a lunch. It’s a laid-back, family style atmosphere provided by the farm’s hosts, and cosy units with full kitchens and enough amenities to get by; they even come with log fireplaces that can both add to the charm and be a godsend during colder months of the year. Plus, as an added bonus, choosing the farmstay as your accommodation means you’ll be able to get UNLIMITED access to the farm and its animals throughout your stay, rather than paying for entry each time. Located in a quiet and peaceful area that’s conveniently easy to access just outside Margaret River, Sunflowers Animal Farm makes for one of the best wildlife experiences in the region while also serving as perhaps the best place to stay in the area for those travelling here with kids. The full magnitude of the diversity of Margaret River’s scenery is hard to take in or fully appreciate from a single viewpoint, so there are few better ways to get an overall view of its colourful landscape than from high above the ground. Enter local operator Wild Blue Helicopters, who specialise in providing guests with some outstanding aerial views of the region at very competitive prices. Based out of a location just to the north of Margaret River town, a variety of flight itineraries are available that cover the gamut of scenic locations in the local area; flights on offer range anywhere from short, 10-minute teasers all the way up to extensive courses that cover the entire Cape-to-Cape coastline mentioned in our “explore the coasts” section above. The variety of towns, wineries, beaches, and colourful sections of fringing reef take on a whole new life when viewed from the air, and it’s from this altitude that one can truly appreciate just how naturally beautiful the Margaret River region is. Informative commentary on all the regional highlights are given via headset throughout the flight, so you’ll not only come away with some incredible views but also some additional knowledge as to what makes this part of Western Australia tick. The company’s operators are proud and passionate about the region – and are able to talk your ear off if need be! – and their friendly and accommodating attitudes help make more comfortable what can be for some a fairly unnerving experience. Private charters to cater for special occasions are also highly popular in addition to the standard itineraries, and packages that combine helicopter tours with landings and lunches at some of the area’s premier wineries can make for a highly memorable way to celebrate like a VIP. Guests can choose from 12 individual wineries that each offer their own distinct take on the proceedings, adding a further layer of customisation to the experience. With key local destinations on offer to choose from including Gracetown, Cape Naturaliste, Geographe Bay, Cape Leeuwin and Margaret River itself, the only limit to the exploration options are your free time and your bank account. A helicopter flight is an item that will likely be on most people’s bucket lists, and there are few better places in Australia to take the plunge then this part of the west coast. Scoring bonus points for uniqueness, the aptly-named Amaze’n is one of the Margaret River region’s signature man-made attractions that serves as a safe and fun place to visit for those travelling alone and with kids. The finely-kept conifer hedge mazes are large, with the giant mage being particularly big, are well-manicured and confusing, with the younger ones always enjoying the fun of losing themselves inside the winding outdoor corridors and discovering something new along the way. There are also built-in challenges – such as finding each of the different-shaped benches dotted throughout the maze – along the way, which keeps it from being just an aimless wander through the different pathways. The disorientation all pays off in the end as, after reaching the elevated middle tower, you’ll have a great view overlooking the rest of the hedges before attempting to make your way out the other side. While the highlight of the attraction is the maze itself, are also numerous other activities to take part in while at Amaze’n including a range of ground puzzles to amuse and confuse, plenty of beautiful gardens to wander through and enjoy, playgrounds for the kids to burn off some energy while you relax with a coffee, a range of other games, and even a relatively newly opened mini golf course located amongst the picturesque surrounds. It’s enough on offer to spend several hours here (depending on how adept you are at navigating the maze!) and enough to allow families to both get their value for money and make it worth the short trip out from Margaret River. A tip of the hat must also be given to the attraction’s excellent cafe, which unlike the standard fare at most similar attractions actually provides some quality dining options (although the overall choice is rather limited). Barbecue lunches are also an option as there’s a dedicated BBQ facility, with on-site lunches also being catered for as well. Friendly local staff and the chance to grab some decent-quality handmade souvenirs cap off the experience, and only serve to add to the pleasant overall atmosphere. One of the more individual days out you’re likely to have in a while – after all, not too many people have done a maze before – Amaze’n makes for one of the region’s most enjoyable and family-friendly attractions. All that rolling countryside to be found in the Margaret River region doesn’t just look good – it also provides the perfect opportunity for inland exploration as well, and there are few more enjoyable and back-to-basics approaches for sightseeing than on horseback. Local trail riding facility The Horse Resort offers exactly that, and it’s a satisfying way to deviate from the standard guided tour experience while still seeing some of the best nature that Margaret River has to offer. Set out over an expansive 500-acre property, The Horse Resort allows visitors of all ability levels – and almost all ages – to participate in some good old-fashioned riding that makes for an ideal family day out, with the horses at the Resort being universally calm, disciplined and well-trained. The staff at the facility are patient and friendly, and always willing to explain the nuances of horse riding to both the first-timers and children and will highlight all the necessary techniques such as turning, braking, stopping and accelerating before setting off on the ride. A variety of different trail rides is available to choose from which scale in difficulty, with beginner rides typically starting off in the large enclosed paddock area allowing participants to get their bearings before heading out into the expansive natural forest which surrounds it. It’s truly a great way to see the inner part of Margaret River without being disturbed by flocks of fellow tourists and maintaining an aura of peace and quiet throughout, and during the journey, you’ll learn all sorts of interesting tidbits about the local area from your friendly horse guides. The forest is an attraction in itself, home to numerous kinds of native Aussie wildlife – except to see more than a few kangaroos during your ride – as well as all the impressive flora that comes with a bush environment. Rides typically last around 2 hours, which will tend to be just enough before the novice rider starts to get a bit saddle-sore. Located just a short 10-minute drive to the north-east of Margaret River town, the entrance to the facility sits along Osmington Road and is fairly discrete; plus, rides take place at varying locations throughout the year, so it’s best to get in touch with the staff before making the drive out. With children as young as 5 able to participate in the fun, it’s an experience nearly everyone can – and should – get to enjoy. This charming little wildlife facility is home to the country’s largest collection of birds of prey and serves as a haven for both breeding and the rehabilitation of injured birds before they recover and are released back into the wild. All kinds of these massive birds can be found here, from hawks and falcons to owls and eagles, and seeing the sheer scale of each of them when viewed from up close rather than high in the air can be as intimidating as it is impressive! Set amongst beautiful natural bushland surrounds, Eagles Heritage Wildlife Centre is a place of both entertainment and education, with a 1-kilometre walking track that takes visitors on a journey to see the enclosures housing the various species firsthand which can be done in around half an hour. In terms of highlights of a visit to the wildlife centre, the twice-daily flight shows held at 11:00 am and 1:30 pm are absolute musts, as they show Black Kites hitting in flight, providing the chance to see them in action while learning about their diets, habitats and behaviours. The knowledge and attitudes of the staff here are substantial, and their passion for their work and conservation efforts is obvious and truly shines through during the display. Afterwards, audience members are welcome to have their photo taken with the Kites perched on their arm – definitely a nice touch, and one of the only places in Australia where you’ll get the chance to do so. The knowledge and attitudes of the staff here are substantial, and their passion for their work and conservation efforts is obvious and truly shines through during the display. In addition, if you’ve never seen them in person before, the undoubted stars of the parks’ proverbial show for you will no doubt be the Wedge Tailed Eagles, the world’s largest bird of prey, whose staggering size is hard to believe when seen in close proximity. While it’s small, quiet and nothing fancy – reflective of its nature as a non-profit rehabilitation-focused facility – Eagles Heritage Wildlife Centre is well worth the visit regardless of if you’re a particular fan of birds or not. Its moderate $17 entry fee is more than reasonable, with funds going directly towards the maintenance and running of the centre, and with its location, just a 10-minute drive south of the centre of Margaret River, the short trip is a small price to pay. Time your visit to coincide with the free-flight displays – and temper your expectations of any kind of a big zoo – and you’ll no doubt have a great time here. Characteristic of much of the coastline of Western Australia, the areas where land-meets-sea around Margaret River are prime examples of rugged, untamed Aussie beauty at their finest – expect to see the likes of impressive Indian Ocean waves crashing against rocky shores and cliff faces, with many areas conducive to some of the best surf in WA. The scenic portion of the coastal region surrounding Margaret River stretches around 100 kilometres in total, and throughout its expanse, numerous rock features and pristine, uncrowded beaches can be encountered at regular intervals, with your own quiet slice of seclusion never too far away. Visitors to the region wanting to soak in the coastal spectacle can thus get a dose of independent sightseeing by simply hiring a car and heading along the coastal roads which provide great outlooks at intervals between one town to the next. Typically encompassing the “Cape to Cape” stretch from Cape Naturaliste in the north to Cape Leeuwin in the south, a number of coves, beaches, breaks and bays along the way is staggering. Be sure to bring your camera along for the journey as the various granite rock figures and vivid green-blues of the water are extremely photogenic, and likely to produce some of the best travel memories you’ll want to take away from the region (all for entirely free). Many of these come equipped with lookout areas – or even car parks in the case of some larger beaches – which provide a great panorama to grab yourself some snapshots, too. Some specific highlights along the course of the drive include Surfers Point (a great spot for surfing, of course, but also swimming and even some light snorkeling in its sheltered reef areas), Boodjidup Beach (about as pristine a stretch of sand as you’re likely to come across in Australia outside of the Whitsundays), and Cape Leeuwin’s characteristic lighthouse (which stands on the shore of a rocky promontory and makes for some great photo ops in itself) among many, many others. While the coastal drive can be done in a couple of hours, given that you’ll likely want to get out and explore at multiple points to make the most of the things, it’s best to allocate a full day to fully enjoy its offerings – or even a couple of days if you’re looking to spend the night in such charming coastal towns as Prevelly, Dunsborough or Gracetown which can be found along the route. Regardless of how much time you’re willing to spend, starting your Margaret River journey off by exploring its coastline is a great way to orientate yourself with the region’s “lay of the land” before exploring its intricacies in greater detail.